Mekong delta, which yields enough rice to feed the country with a sizable surplus, was formed by sediment deposited by the Mekong. The process continues today, with silt deposits extending the shoreline by as much as 80m per year. The river is so large that it has two daily tides. Lush with rice paddies and fish farms, this delta plain also nourishes the cultivation of sugarcane, fruit, coconut and shrimp. Although the area is primarily rural, it is one of the most densely populated regions in Vietnam and nearly every hectare is intensively farmed. In the morning, leave the hustle and bustle of the big city behind as the scenery is gradually replaced with rice paddies and rural villages on your drive to BenTre. En route, we’ll stop and pay a short visit to a wet market in Ben Tre. Taking a boat trip around Ben Tre islets to sight-seeing local activities on the river. Stop to see how people to make bricks, salt. Then, continue taking a boat to Cai Sơn and Nhơn Thạnh creeks to visit some family making mats. Take motor cart (xe lôi) passing by rice fields and vegetable plains to know the local people’s life in the country. After that, take a rest and have lunch at Mr. Hai Hồ’s House. You will find the South-East people’s hospitality and enjoy their simple and healthy food that surely makes your trip even more enjoyable. 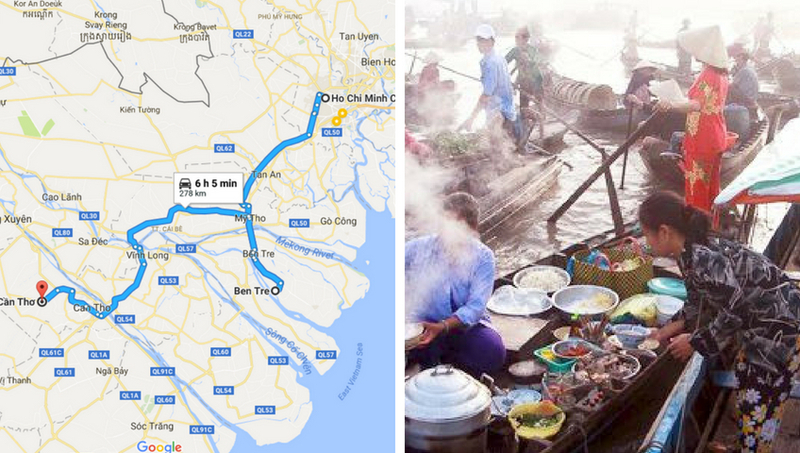 After Vietnamese lunch, you will take a rowing-boat along water palm creek and Cái Cối creek. Return to Ben Tre city for heading to Can Tho city. Arrive in Cantho city late this afternoon then taking a boat to a local home stay. Living in a typical Vietnamese house, with airy rooms and outdoor kitchen, they welcome guests with gracious hospitality and the experience offers a true taste of Delta life. The rest of this afternoon is free to bike the dirt paths surrounding the home stay or to join a cooking demonstration. The homestay hosts show you how to prepare some Vietnamese dishes. Dinner will be served at the home stay. In Cantho, take a boat to visit the colorful Cai Rang floating market. Here, during the early morning market hours, larger sized boats anchor and create lanes that smaller boats weave in and out of. The main items sold here are fruit and vegetables and each boat has a long upright pole at its bow from which samples of the goods for sale are hung. The waterway becomes a maze of hundreds of boats packed with mango, bananas, papaya, pineapple, and even floating pho vendors. Then, we have a walk “monkey” bridges to get closer to the local life. We also visit a rice husking mill, rice noodle makers before coming back to the hotel. At a local restaurant, we can taste the Mekong specialties before we continue exploring the most beautiful & peaceful things of the Mekong delta. Along the way, admire the scenery and daily life of the local villagers. After a traditional Mekong style lunch will be served, we are going ahead to the Binh Thuy ancient house or Binh Thuy Orchid Garden following the French architectural style which was chosen the house to shoot movies like French flick L’amant directed by J.J Annaud. Meals as mentioned (2 lunches, 1 dinner, 1 breakfast), 1 night Homestay at Can Tho city, Tours and Transfers by air-conditioned vehicles, English/French speaking tour guide, Mineral water.